Removal ProcedureRemove the fuel tank. Refer toFuel Tank Replacement. Disconnect the crossover tube from the secondary fuel pumpmodule. Refer toFuel Tank Fuel Pump Module Replacement - Secondary. 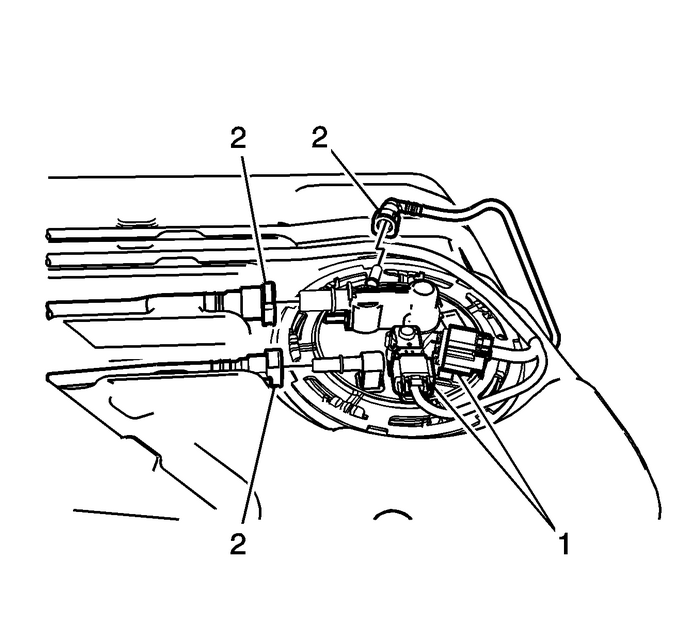 Disconnect the electrical connectors-(1).Disconnect the fuel and evaporative emissionlines-(2). Refer toPlastic Collar Quick Connect Fitting Service. 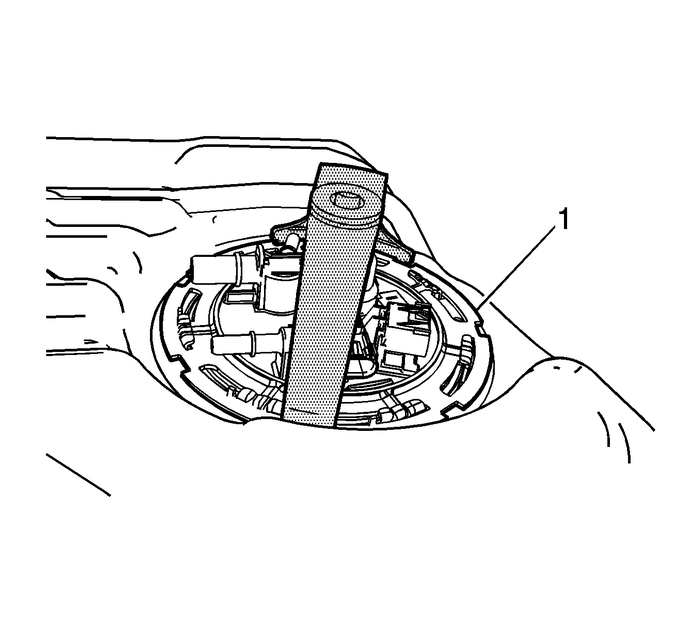 Using theJ-45722wrench, remove the cam lock ring-(1)-byturning counterclockwise. If replacing the fuel pump module only, install the primaryfuel level sensor. Refer toFuel Tank Fuel Pump Module Fuel Level Sensor Replacement.Install a NEW O-ring-(2)-and theprimary fuel tank module-(1). Using theJ-45722wrench, install the cam lock ring-(1)-byturning clockwise. Connect the electrical connectors-(1).Connect the fuel and evaporative emissionlines-(2). 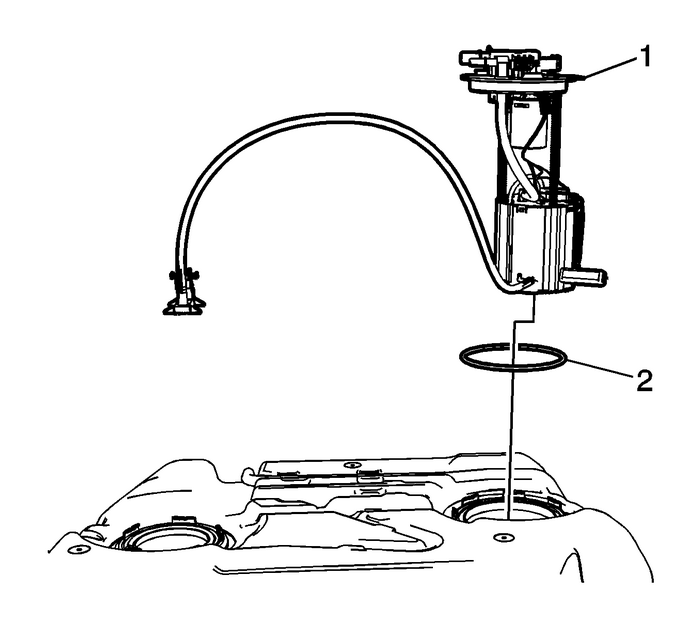 Refer toPlastic Collar Quick Connect Fitting Service.Connect the crossover tube to the secondary fuel pump module.Refer toFuel Tank Fuel Pump Module Replacement - Secondary.Install the fuel tank. Refer toFuel Tank Replacement.